The intent of this document is to provide an overview of the invoicing processes within SpecVet to the general staff. There are many more specific details around invoicing, privileges, etc. that are not going to be addressed in this document. When a Visit is created, SpecVet will automatically create an invoice for that visit. 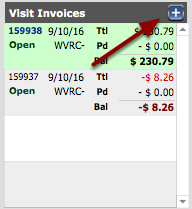 Users may create additional invoices for a visit by clicking on the “+” icon at the top of the invoice list. Additional invoices might be needed for businesses that operate separate sites, or perhaps if an invoice was closed and additional items need to be invoiced or credited. Visits have Active Invoices that are where SpecVet will add automated billing items onto. Intended for when clients choose to purchase products “over-the-counter”or for prescription refills. Invoices for prescription refills are created automatically when users select “Invoice/Pick-Up” from the prescription area on the Clinical Dashboard. Indicates that the invoice may be edited if you have proper permissions. Billing items are able to be added to the invoice. Billing items can be modified* on the invoice provided the item’s Bill Code allows such editing (editing of Provider/Description/Price are all controlled by how the Bill Code is setup). Billing items can be deleted* from the invoice. *As long as it is within the hospital's designated invoice editing timeframe. Billing items can be deleted* from the invoice. *As long as it is within the Sites invoice editing timeframe. Indicates that the invoice is Locked; changes cannot be made. Once an invoice is closed, it is not possible to re-open the invoice. If a billing item allows it; the provider may be changed if done within the invoice lockout period. When an invoice is closed and there is a credit balance, the invoice is considered a “Credit Invoice”. These are closed invoices that have a balance due of zero. 1. There must always be an active invoice (indicated by the blue bolded invoice ID in the Visit Invoice list) for a visit unless the “Billing Complete” checkbox in the Discharge Steps section on the Visit Report screen has been checked. This is due to SpecVet needing to have an open invoice to be able to add billing for our automated processes such as Orders, Prescriptions or from the Inventory Management System – IMS – (Pyxis and Cubex). 2. An invoice cannot be closed unless the Billing Complete checkbox has been checked if it is the only open invoice for that visit. 3. The Billing Complete checkbox can be unchecked so long as there is an open invoice for that visit. 4. 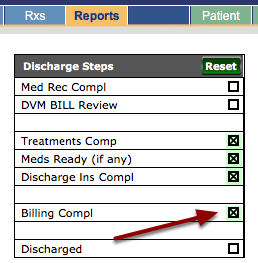 When printing invoices from the report page, if the “Billing Complete” Discharge Step has been checked; the invoice will be automatically CLOSED. 5. Visit Invoices can only be closed from the Visit. 6. If there is not an Active Invoice, and an Order is performed that causes billing to occur; SpecVet will automatically create a new Visit Invoice in order to bill the Order charges. 7. In order to make a new Rx for a visit, there must be an Active Invoice for the Visit. 8. When dispensing an Rx that was made in a Visit; if there is not an Active Invoice,SpecVet will create a new Client Invoice in order to bill the Rx. 1. When printing a client invoice, the user will be asked whether or not a Preliminary or Final invoice is printed. If Final is selected, the invoice will be closed and the invoice will print. 1. Preliminary Invoices can be printed at any time and this will not close out the invoice. 2. Discounts, sales tax settings, and productivity settings can all be edited from within the Invoice Info page, if the invoice is open. 3. 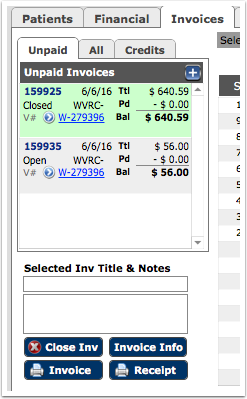 Invoices are for a specific site; and users are able to change the site from within the Invoice Info popup window. 4. When making Non-Visit/Client Invoice, or multiple Visit Invoices, it is suggested that the user inputs an Invoice Title and/or Notes so as better identify the reason for the invoice. Invoice is automatically created at time a Visit is created. Users add billing to the invoice, as do the automated processes within SpecVet. When the visit is ready to be discharged, the provider (or responsible person) is to review the invoice and ensure that all the appropriate charges are on the invoice. Close attention should be paid to Order Items; Prescriptions and IMS (inventory management system) items. If the invoice is proper, and is reflective of the work that has been performed; users should go to the visit "Reports" page, and check off the“Billing Compl” checkbox. This will then allow the invoice to be closed. iii. Print the invoice that will then close the invoice. Invoices from prescription refills or other product based purchases. From the Client Invoice tab, users are able to print the invoice and will be prompted whether or not they wish to print a final/closed invoice ora preliminary invoice.